iRoom‘s iTop Table mount for iPad with it smart function Access Keys to the side of your iPad, is beautiful whilst also likely being the smartest table-top iPad charging station in the world. Designed for high end residential and commercial applications such as board rooms and home theatre. Built in Austria to the highest quality, it has an ultra-premium solid glass and cast aluminium finish appropriate for your luxury spaces. The quick access keys work with many of the industry’s leading Home Automation Control brands. Commonly used control functions can be assigned to six quick keys on its glass faceplate, giving the operator immediate control of lights, blinds, etc. or possibly direct access to another IP addressable devices. The iTop is also capable of handling Macros and command sequences. For example, you could turn on your television, dim your lights, close the curtains and start your favourite movie by simply pressing a quick access button. 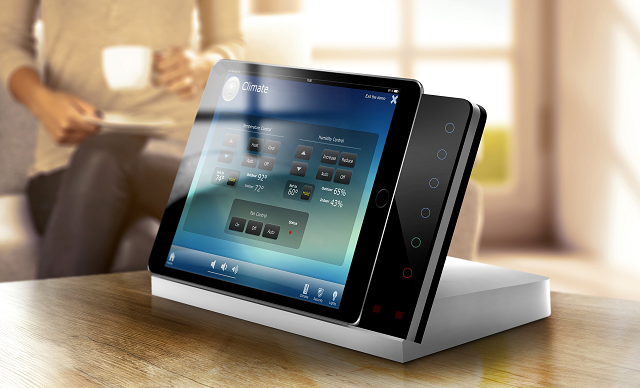 iRoom’s iTop - combines a most elegant table top iPad charging station with which you can also control your favorite home automation application through a simple touch on the glass bezel. A more cost effective but great looking 'Basic' model is available without the integrated button keypad for clients not requiring hard button functionality to home automation and control system. * in standard unit, basic unit has no integrated control button keypad.